● Solar Powered, Long Time Working - let the solar panel face sunshine directly during the day, the lights will shine automatically at night for 8 hours. COST SAVING AND POWER EFFICIENT, NO EXTRA ENERGY is required. 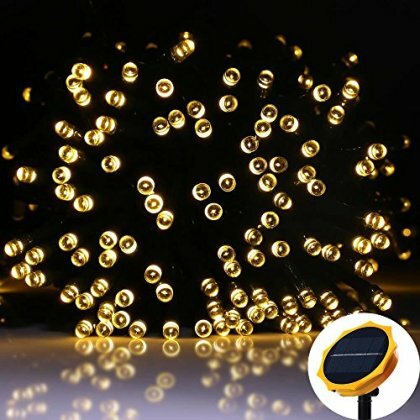 ● 200 LEDs Per Set, Longer and More Economical -- 200 clear LEDs, totally 72 feet wire with 6.5 feet lead circuit, covering large area and comfortable illumination effect. Festival Celebration Decorations -- put on wall, window, door, floor, ceiling, grass, tree, flowers, post or building, adds perfect atmosphere to your garden, patio, lawn, gazebo, wedding, party. these solar string lights replace your traditional plug-in string lights with these solar-powered beauties, MAKING YOUR ENVIRONMENT STAND OUT. ● LONG-WORKING TIME - large power capacity rechargeable battery can work continuously for 8 hours once fully charged. Just replace the RECHARGEABLE BATTERY WITH NORMAL BATTERY when there is not enough sunshine, then it will work. ● EASY Use -- 2 switch buttons to control. One for power, another for 8 light effect modes (flash, steady, etc.) to choose.